Not the same as Love Potion No. 9, but almost as much fun! Depending on which browser you're using to view this blog, you may not be able to properly view some or maybe even all of these characters. Assuming you're on a Mac and using the latest versions of Safari or Firefox, it shouldn't be an issue. I thought with Valentine's Day here, you might enjoy a nice tip for getting to those cute little hearts and other fancy symbols quickly. First you'll need to configure your International System Preference Pane and then you'll need to configure the Character Palette to show just your favorite or most-used characters. Once this is done, you'll be just 2 clicks away from accessing the characters you use on a regular basis. I find this helpful for when I'm trying to communicate a set of instructions in which I can use the shortcut key symbols. Did you ✔ to see if the tickets are on sale? Would you like for me to ☏ you at a special ⌚ ? Did you remember to ♺ your paper? Step 1. Configure your International Preference Pane available by selecting the System Preferences from the Apple Menu in the upper left hand corner of your screen. Step 2. You will see a little flag icon in your Menu Bar. 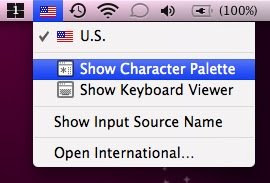 Click on it once to reveal a drop-down menu from which you can select Show Character Palette. Step 3. Configure your Character Palette by selecting your Favorite characters. Look closely at this screen shot (click to enlarge) and pay attention to each of the areas where you'll need to click. Make your Character Palette look like this. Select a character you want to favorite by clicking on it once to highlight it. Next, click on the cog wheel at the bottom and choose 'Add to Favorites' from the drop-down menu.